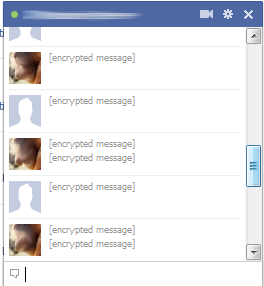 Chatting on Facebook is great, but has one major drawback: Facebook records and keeps everything you say. If you think that’s not a problem (e.g. because you subscribe to the “I have nothing to hide, therefore I have nothing to fear” camp), you can stop reading here. … and you’re not comfortable with Facebook, Facebook’s partners and law enforcement agencies around the world being able to read your conversation at their leisure (even years after it happened! ), please read on. By not using the built-in chat feature from within the Facebook webpage. Instead, we’ll use software that encrypts your messages, so that even Facebook cannot read them. 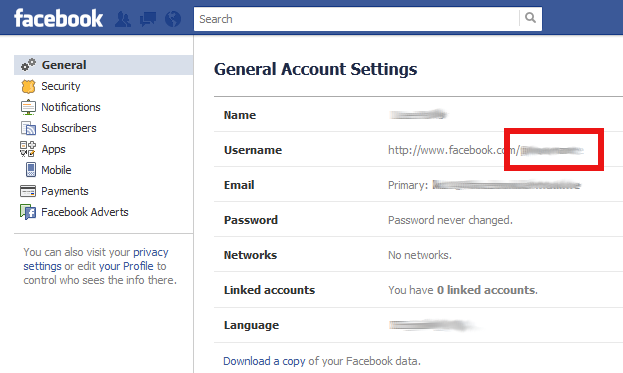 Facebook General Account Settings: You have not set a username. Don’t worry – you can get a username right away! Please note it down – you will need to use your Facebook username (just once!) it in a bit. Type your usual password for the “Password” field. I don’t understand why Facebook force people to do this, but this logout & re-login seems to be required to get your new username activated. You are now ready to setup a private chat system. Click on “Add…” – a new window comes up. If you see something like the above, congratulations – you are successfully connected to Facebook chat. 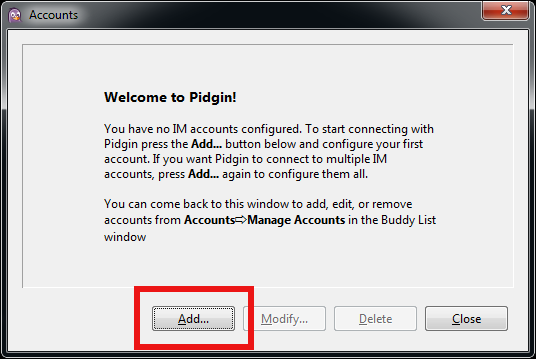 If you get any error messages, modify your account settings and make sure you have typed everything as shown above. Remember, your Facebook username is not your real name! Congratulations! 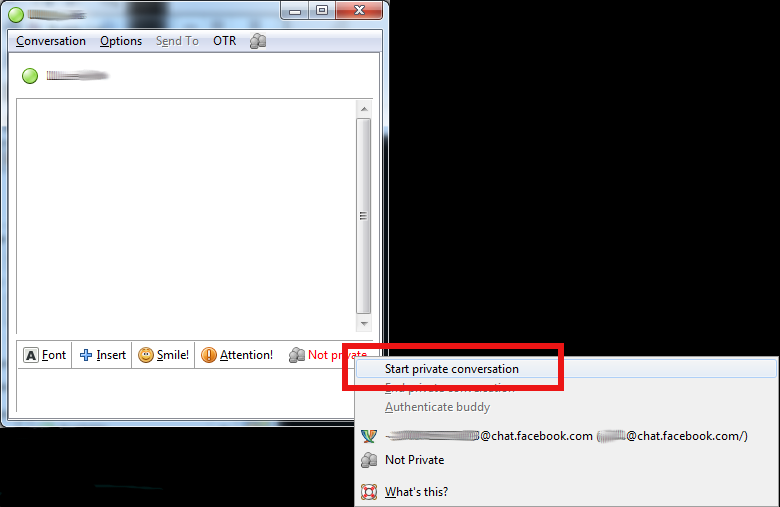 You can now chat privately with friends who also use the OTR plugin. You have just made it very difficult for Facebook or anyone else to eavesdrop or record what you say. Just point your Facebook friends to this page and get them using the OTR plugin! 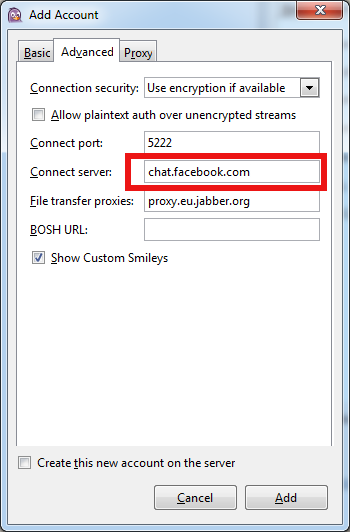 You can communicate privately only if the Facebook friend you’re communicating with has followed the above steps, or is using other software that uses the OTR plugin. Double-click on their name to bring up the Conversation window. Notice the “Not private” button on the bottom right? This is the result we want. “Unverified” is not a problem (but see “Improvements” section below). 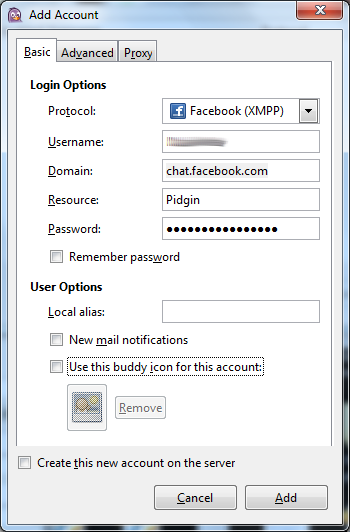 Pidgin tells us that it has established a secure channel to the other end, and you can already use to chat if you wish. Is this not working? 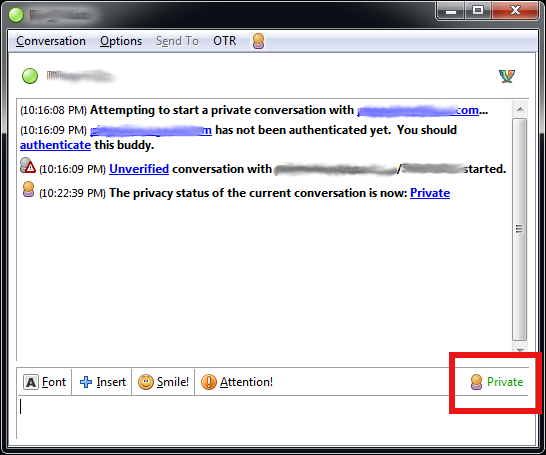 Does your request to “Start private conversation” seem to do nothing? Here is a possible reason. You may need to “enable apps” on your Facebook profile. 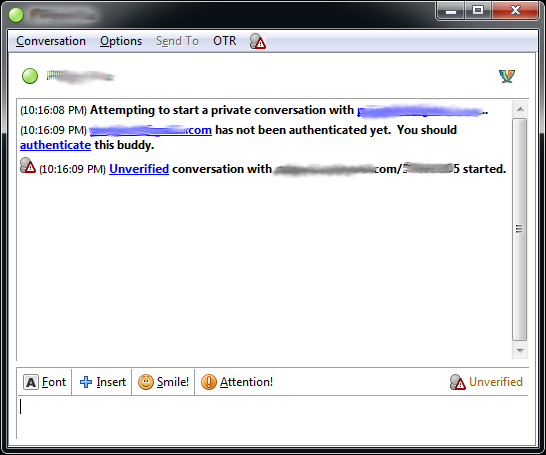 With an “Unverified” OTR status you can not yet be 100% certain that the person you are talking to, is indeed your friend and not an impostor, pretending to be your friend. To rule out this possibility you should always verify the people you chat with. You only need to do this once for every friend you wish to chat with. For technical reasons Facebook users have to verify the identity of their friends manually, by comparing so-called “fingerprints“. 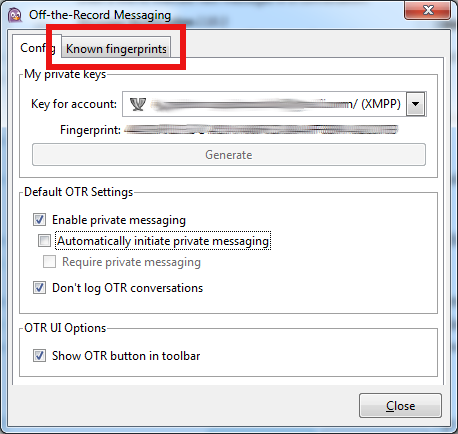 In the “Off-the-Record Messaging” window click on the second tab “Known fingerprints”. 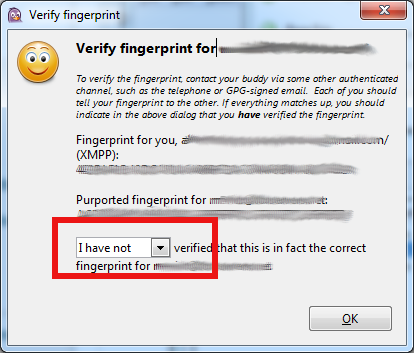 Then select your unverified friend and click the “Verify fingerprint” button. 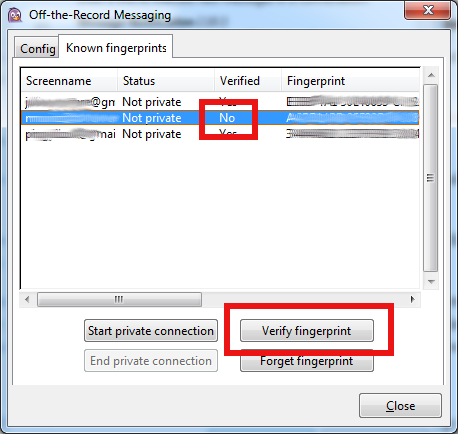 This is annoying, as it requires you to use another communication channel with your friend (perhaps telephone or email, depends on who your enemies might be) to confirm each other’s fingerprint, but as of April 2012 this is the only option Facebook users have. That was the hard part done. After you click “OK”, you don’t have to worry about this again. 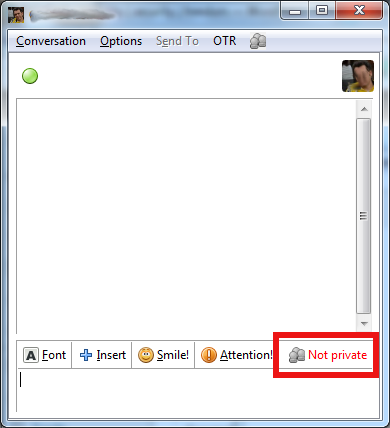 Next time you wish to talk to this friend, you will just need to click on the OTR button on the bottom right and the conversation will immediately switch to “Private”. What, you still don’t like that? What are you doing chatting on Facebook then?! Go use CryptoCat over Tor, or if your enemies are pros (and you trust your hardware), TAILS. It’s called “web tracking” and “behavioural profiling”, but the result is the same. Every search you make, every email, every chat message and every page you visit is combined by e-commerce giants (Facebook, Apple, Google, Amazon etc) to create an accurate profile of… you! This is then sold to the advertisers who want to better target you as a consumer. For more background on online behavioural tracking see the Wall Street Journal’s “What They Know” project and EFF‘s Do Not Track page. They record any other websites you visit and what you do in them (where you click, how long you spend in a page etc). This is true of most websites, even those not directly affiliated with Google. There is little you can do about #1. I avoid using Google for search, relying on the privacy-conscious DuckDuckGo search engine instead – which promises not to share my searches with Google. I log out of Gmail and Facebook as soon as I’m done using them. I close my browser and delete my cookies. But even if you do all that, they and their partners still know a lot about you. For #2, there is something you can do. 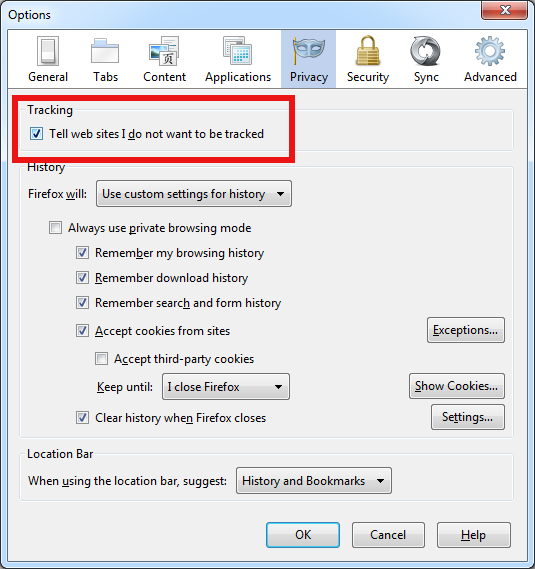 Due to the work of some good people, you have a way of telling them you do not want to be tracked: Enable the “Do Not Track” (DNT) feature of your web browser. Visit http://donottrack.us/ to check if DNT is enabled in your browser and if not, enable it now – it will only take 2 minutes. As of March 2012 DNT is supported by all major browsers except -unsurprisingly- Google Chrome. 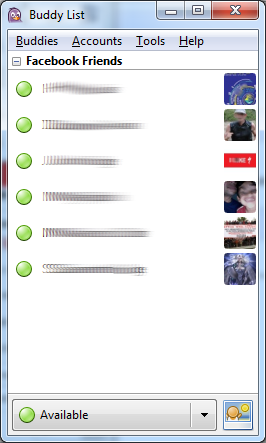 Step 2: Click the "Privacy" icon on the top row and then check the "Tell web sites I do not want to be tracked" box. Please note that enabling Do Not Track (DNT) does not stop websites from tracking you. It merely indicates that you do not wish to be tracked. This is important, because it approaches the practice of web tracking from two sides: Technology and policy. Solely relying on technological solutions to supress/evade web tracking could never be fully successful – marketers would always find ways around your techical defenses, while publicly arguing that web users want to be tracked because it provides a better online (purchasing) experience. But DNT has a policy side as well: It allows regulatory bodies like the FTC to nudge marketers to honour the DNT setting. The result is much more effective than a mere technological workaround: If consumers use DNT to clearly indicate “I do not want to be tracked” and the FTC has ruled that marketers must respect this choice (which has not happened as of March 2012), marketers take a lot of risk by ignoring DNT and tracking you. Such behaviour would expose them to lawsuits, fines from the FTC, harm to their brand, public image etc. Think of DNT as the “Do Not Call” registry for the World Wide Web. By subscribing, you’ve just made DNT stronger and the Web a better place for all. PS: For the sceptics who worry DNT might kill “free” online services via hurting online advertising revenue, Stanford Law School’s Center for Internet and Society has a good analysis of why this is unlikely to happen here. PPS: As Harvard Law professor Jonathan Zittrain put it: “If what you are getting online is for free, you are not the customer, you are the product.” You have to decide if you are comfortable being commodisised like this. PPPS: I recently asked Mozilla’s Tom Lowenthal what good DNT is, if users don’t even know it’s there. 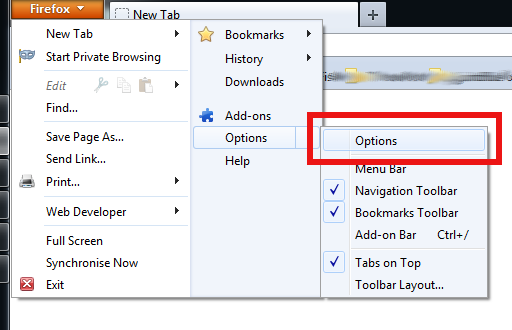 Even if they do, how many real people will choose to venture 6 clicks deep in computer-gibberish settings pages to enable DNT? Tom re-stated that the Mozilla people do not want DNT “on” by default, therefore making it an “opt-in” feature, the cost of which should be obvious by the mere existence of this blog post. 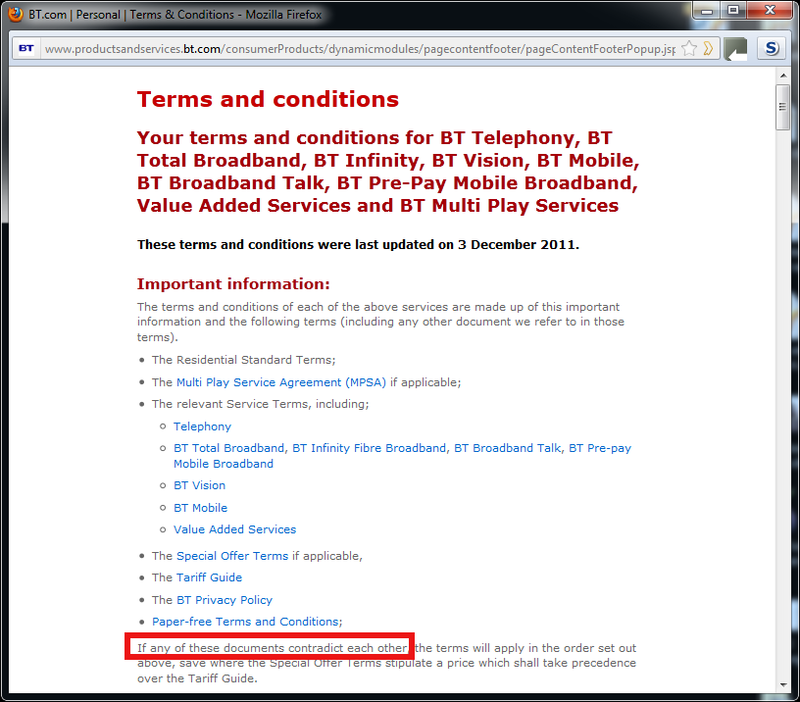 As of March 2012, BT’s terms of service for broadband customers are officially too complicated for human beings. It’s a good book, of potential interest not just to technology people, but also to anyone wishing to understand more about the way the world works. Schneier uses a wealth of examples to demonstrate that without implicit trust towards pretty much everyone around us, society falls apart. Reading this book convinced me once more that calls for more surveillance and a more extensive police state must be resisted. The underlying assumption (that crime can be brought down to 0% if only we give up most of our liberties) is a false one. Schneier convincingly argues that the cost of wiping out crime is too high for society – we should therefore stop the hysteria about “total security” and get on with our lives. It has been convincingly argued that one of the reasons sexual reproduction evolved about 1.2 billion years ago was to defend against biological parasites. The argument is subtle. Basically, parasites reproduce so quickly that they overwhelm any individual host defense. The value of DNA recombination, which is what you get in sexual reproduction, is that it continuously rearranges a species’ defenses so parasites can’t get the upper hand. For this reason, a member of a species that reproduces sexually is much more likely to survive than a species that clones itself asexually—even though such a species will pass twice as many of its genes to its offspring as a sexually reproducing species would. Only 10% of the total number of cells in our human bodies are us—human cells with our particular genome. The other 90% are symbionts, genetically unrelated organisms. We engage in honest commerce, although Enron and AIG and Countrywide are some pretty spectacular exceptions. They found no difference in cheating behavior between believers and non-believers, but found that people who conceived of a loving, caring, and forgiving God were much more likely to cheat than those who conceived of a harsh, punitive, vengeful, and punishing God. People vary in their individual behaviour . Sure, most people will cooperate most of the time, but some people will defect some of the time, and almost everyone will defect once in a while. A mass murderer’s view on the paradox of how we perceive tragedy. Philip Morris renamed itself Altria, because who would want to buy their Kraft Mac and Cheese from a cigarette company? ValuJet, its brand ruined after Flight 592 crashed in the Everglades in 1996, now operates as AirTran Airways. Blackwater, the defense contractor notorious for numerous Iraq war abuses, is now Xe Services. The School of the Americas, implicated in training many human rights–abusing military staff in Latin America, rebranded itself as Western Hemisphere Institute for Security Cooperation. In the U.S., voter turnout is so low in part because there’s no legal requirement to vote. In countries where voting is required by law—Australia, Belgium, Bolivia, etc.—turnout is much higher. This is also true in countries that don’t have explicit voting laws, but have laws that raise the cost of not voting in other ways. For example, in Greece, it’s harder for non-voters to get a passport or driver’s license. If you don’t vote in Singapore, you’re removed from the electoral rolls and must provide a reason when you reapply. In Peru, your stamped voting card is necessary to obtain some government services. And in Mexico and Italy, there are informal consequences of not voting. One report demonstrated that uninsured drivers in the UK are capable of doing the math, and will remain uninsured if the expected penalty for doing so is less than the cost of insurance. It doens’t matter what you say – it matters how you say it. For this reason, signs featuring anti-littering slogans like “Don’t Mess with Texas” are more effective than signs that only warn, “Penalty for Littering: $100”; and “smoking in hotel rooms is prohibited” signs are more effective than signs that read “$250 cleaning penalty if you smoke.” In one experiment with day care providers, researchers found that when they instituted a fine for parents picking their children up late, late pickups increased. The fine became a fee, which parents could decide to pay and assuage any moral resistance to defection. Financial advisors exhibit this unconscious bias in favor of their clients. In one experiment, analysts gave different weights to the same information, depending on what the client wanted to hear. An obvious societal pressure system to address this problem would be to require advisors to disclose any conflicts of interest; but this can have the reverse effect of increasing the number of defectors. By disclosing their conflicts, financial advisors may feel they have been granted a moral license to pursue their own self-interest, and may feel partially absolved of their professional obligation to be objective. Between the ubiquity of keyboards and the tendency for teachers to focus on standardized tests, cursive is not being taught as much in schools. The result is that signatures are more likely to be either printed text or illegible scrawls, both easier to forge. The poorer the job is—the less well-paying, the less personally satisfying, the more unpleasant, etc.—the more restrictive the security measures tend to be. Minimum-wage employees are often subject to rigorous supervision, and punitive penalties if they defect. Higher-level employees are often given more latitude and autonomy to do their job, which comes with a greater ability to defect. The DeCoster family egg farms, responsible for the huge salmonella outbreak in 2010, had been repeatedly fined for health violations for over ten years. In 2011, the large pharmaceutical company Merck Serono agreed to pay a $44.5 million fine for illegally marketing the drug Rebif. That sounds like a lot, until you realize that the annual sales of the drug were $2.5 billion and the misconduct occurred over an eight-year period. It’s no wonder the firm was a repeat offender; the fines were just a cost of doing business. Any company that is too big to fail—that the government will bail out rather than let fail—is the beneficiary of a free insurance policy underwritten by taxpayers. No one in the U.S. government is interested in taking the National Security Agency to task for illegally spying on American citizens (spy agencies make bad enemies). Or in punishing anyone for authorizing the torture of—often innocent— terrorist suspects. Similarly, there’s little questioning legislatively about President Obama’s self-claimed right to assassinate Americans abroad without due process. These days, if you’re making a 5% return on your investments, you’re doing really well. With the top federal tax rate at 35%, the money you can save by cheating is a pretty strong motivation. These are not people who can’t afford to pay taxes; the typical tax cheat is a male under 50 in a high tax bracket and with a complex return. (Poorer users, with all their income covered by payroll taxes, have less opportunity to cheat.) The current situation creates an incentive to cheat. And make no mistake, industries, professions, and groups of wealthy people deliberately manipulate the legislative system by lobbying Congress to get special tax exemptions to benefit themselves. One example is the carried-interest tax loophole: the taxation of private-equity-fund and hedge-fund-manager compensation at the 15% long-term capital-gains tax rate rather than as regular income. Another is the investment tax credit, intended to help building contractors, that people used to subsidize expensive SUVs. Currently in the United States, standardized student testing has incredible influence over the future fates of students, teachers, and schools. Under a law called the No Child Left Behind Act, students have to pass certain tests; if they don’t pass, their schools are penalized. In the District of Columbia, the school system offered teachers $8,000 bonuses for improving test scores, and threatened them with termination for failing. Scores did increase significantly during the period, and the schools were held up as examples of how incentives affect teachers’ behavior. It turns out that a lot of those score increases were faked. In addition to teaching students, teachers cheated on their students’ tests by changing wrong answers to correct ones. There’s a societal dilemma at work here. Teachers were always able to manipulate their students’ test scores, but before the No Child Left Behind law, the competing interests were weak. People become teachers to teach, not to cheat… until their jobs depended on it. We’re all better off if national policy debates are factual, honest, and civil, but it’s easy to resort to spin, distortions, smears, and lies. But if enough people do that, you get the circus that characterizes far too much of current American politics. In mid-2004, the New York Times learned about the NSA’s illegal wiretapping of American citizens without a warrant, but delayed publishing the information for over a year—until well after the presidential election. In 2011, science fiction author Charles Stross gave a talk on the ubiquity of data that’s coming in the near future, from technologies like genetic mapping, “lifeblogging”—the audio and video recording of everything that happens to you—sensors on everyone and everything. Nothing he said required anything more than mild extrapolation. And then he talked about the issues that society is going to have to wrestle with once this data exists: Is losing your genomic privacy an excessive price to pay for surviving cancer and evading plagues? (Broad analysis of everyone’s genetic data will result in significant new understanding about disease, and a flurry of medical results that will significantly benefit everyone. At the same time, an individual’s genetic data is both personal and private—even more so when companies start using it to prejudge people.) Is compromising your sensory privacy through lifeblogging a reasonable price to pay for preventing malicious impersonation and apprehending criminals? (Lifeblogs have the potential to be a valuable police tool, not just by allowing victims to record crimes, but in the incidental recording of events in the background that later could be instrumental in identifying criminals.) Is letting your insurance company know exactly how you steer and hit the gas and brake pedals, and where you drive, an acceptable price to pay for cheaper insurance? (Once insurance companies have all of this data, they could more easily offer differing insurance policy to different types of drivers.) These are all societal dilemmas about how to balance group interest with selfinterest.But before figuring out what kind of societal pressures to deploy to solve the problem, society first has to agree what the group interest is. We can’t start talking about what kind of societal pressures to set up to prevent people from keeping their genome secret, or protecting the privacy of their lifeblog, or limiting access to their car’s “black box” data, until we agree on what it means to cooperate and what it means to defect in these situations. It’s difficult to solve societal dilemmas while society itself is changing so quickly. + Reduce concentrations of power. Power, whether it’s concentrated in government, corporations, or non-government organizations, brings with it the ability to defect. The greater the power, the greater the scope of defection.7 One of the most important things society can do to reduce the risk of catastrophic defection is to reduce the amount of power held by individual actors in key positions. + Require transparency—especially in corporations and government institutions. Transparency minimizes the principal–agent problem and ensure the maximum effect of reputational pressures. In our complex society, we can’t monitor most societal dilemmas directly. We need to rely on others—proxies—to do the work for us. Checks and balances are the most powerful tool we have to facilitate this, and transparency is the best way to ensure that checks and balances work. A corollary of this is that society should not suppress information about defectors, their tactics, and the overall scope of defection. Remember, parasites need society to be there in order to benefit from defecting; and being a parasite is a successful strategy only if you don’t take too many resources from your host. Society needs defectors. Groups benefit from the fact that some members do not follow the group norms. These are the outliers: the people who resist popular opinion for moral or other reasons. These are the people who invent new business models by copying and distributing music, movies, and books on the Internet. These are people like Copernicus and Galileo, who challenged official Church dogma on astronomy. These are the people who—to take a recent example—disrupt energy auctions to protest government inaction on climate change. They’re also people living on the edge of society: squatters, survivalists, artists, cults, communes, hermits, and those who live off the grid or off the land. In 2011, U.S. Marine Dakota Meyer received the Medal of Honor for saving three dozen of his comrades who were under enemy fire. The thing is, he disobeyed orders in order to do so. Defection represents an engine for innovation, an immunological challenge to ensure the health of the majority, a defense against the risk of monoculture, a reservoir of diversity, and a catalyst for social change. It’s through defection from bad or merely outdated social norms that our society improves. Sometimes a whistle-blower needs to publish documents proving his government has been waging an illegal bombing campaign in Laos and Cambodia. Sometimes a plutonium processing plant worker needs to contact a reporter to discuss her employer’s inadequate safety practices. And sometimes a black woman needs to sit down at the front of a bus and not get up. Without defectors, social change would be impossible; stagnation would set in.